Alan is an associate with the European Institute of Social Services. He also provides services to Middlesex University on issues relevant to community cohesion and research projects, based on his decades long experience with London Probation Services. He has been a founder member and later chair of the Refugee, Asylum Seeker and Foreign National Offenders group. He joined the London Probation Diversity Directorate in 2003 and developed a range of community partnerships and externally funded projects. 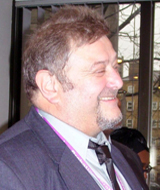 In 2006 following the successful management of the Reducing hate Crime (an European funded project) he took the role of European Projects Manager and went on to steer London Probation to become the only Probation service in Europe with Frame work partner status with the DG Justice, Security, Freedom. Whilst in Probation he lead on the Reducing Influences that Radicalise Prisoners (RIRP), Towards Preventing Violent Radicalisation (TPVR). In London Probation he developed work on targeted crime especially “Hate” motivated and Violent Extremism.